'It can't be that come June 2019 and Priyanka goes back to her cocooned life, to re-emerge five years later because the family business is in trouble again,' says Saisuresh Sivaswamy. 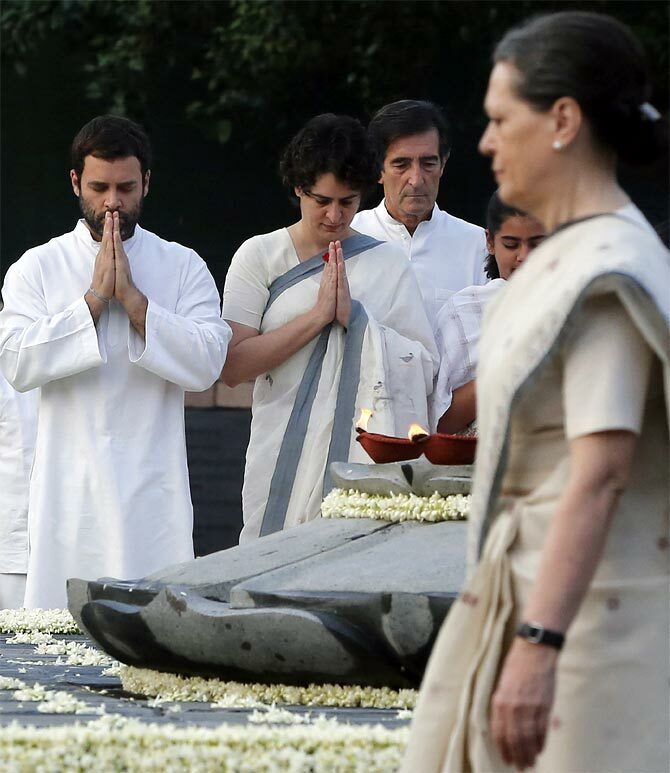 IMAGE: Rahul and Priyanka Gandhi with their mother Sonia Gandhi at their father Rajiv Gandhi's memorial in New Delhi. Is Priyanka Gandhi-Vadra's political baptism a case of too little, too late, as the dynasty's numerous critics say? Is what the television news channels quickly dubbed as the Congress party's Brahmastra, a weapon that has been deployed at least 10 years too late? Is the Congress party, and its adherents who may still be around, living in cuckoo land believing that the dynasty is the panacea for all its and the nation's ills? Do they realise that to take on the rampaging Bharatiya Janata Party, the Congress needs not a name, not a Naamdar (to recall Prime Minister Narendra Damodardas Modi's term) but robust policies and a clear-cut ideology? And that charisma is not a prescription drug anymore for election victory? There are no answers to any of these questions because, at 47 years of age, just a year short of her grandmother's age when the latter first became January prime minister in 1966, the much-heralded Priyanka Gandhi has had no active political experience, if you discount her stints as campaign manager for her mother in Rae Bareli. This is akin to asking Shahbaz Nadeem, a most promising bowler in first class cricket, to open the bowling against Ross Taylor in the cricket World Cup -- a disastrous move, but one that would be hailed as simply audacious if it pays off. Similarly, the Priyanka gambit could fail spectacularly, or blaze a trail of glory. Politics is a gamble, and in its desperation to defeat the BJP and Modi in the Lok Sabha election a few weeks hence, the Congress party has displayed its willingness to both bluff and call the opponent's bluff. It has taken the party a while to adjust its game to a foe who fights a no-holds-barred battle, and the wake-up call came with the Goa assembly polls in which it emerged the single largest party and yet suffered the mortification of being pipped at the governor's house by a win-at-all-cost BJP. And in Karnataka it showed it meant business in keeping the BJP out of power by letting the smaller Janata Dal-Secular form the government with its support, in a throwback to 1996 when the Congress did the same at the Centre with the United Front. Those asking why the Congress wheeled out Priyanka now and not earlier must be pointed to two recent dates. January 5 and 7. The first, a Saturday, was when Akhilesh Yadav of the Samajwadi Party and Mayawati of the Bahujan Samaj Party joined hands to carve out Uttar Pradesh's Opposition space between them, effectively shutting the doors on the Congress and laying claim to the anti-Modi, anti-BJP space in the state. Even as the Congress put up a brave front, a second blow followed in barely two days, with Modi announcing 10 percent reservations for the economically weaker sections in the open category in government jobs and education, and signalling the ruling party's power play tactics in the slog overs. And when West Bengal Chief Minister Mamata Banerjee showcased her own political ambitions with a mega rally in Kolkata last Saturday, January 19, the Congress had to act fast to show it meant business, too. Why it took so long for the Congress to send Priyanka to the frontlines, after it seemed clear early on that it was she, and not her unsung brother, who would take the family legacy forward, will always remain in the shadow zone where truth and untruth merge. Having taken the first step, Priyanka will do well to remember that politics is not a part-time occupation, nor is it meant for guest appearances and cameos. Politics is serious business, and Modi-Amit Anilchandra Shah are as formidable opponents as they come. It can't be that come June 2019 and Priyanka goes back to her cocooned life, to re-emerge five years later because the family business is in trouble again. But politics is also as much about perception and optics as it is about performance and delivery. And it's here that the Congress has managed to steal a show over the BJP, by sending out the message that it is in it for the long haul, it has enough heart for a fight and will not back down under any circumstance. You can even call it a desperate throw of the dice. 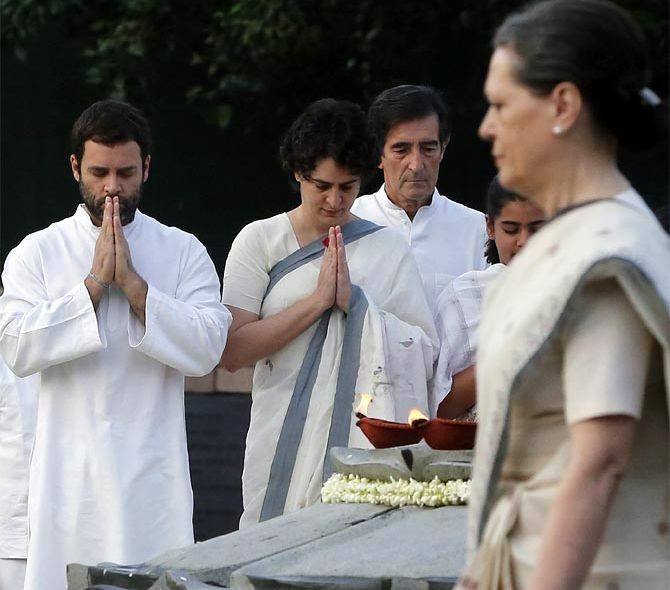 This gamble may not find resonance with those who look upon the Nehru-Gandhi family with disdain and scorn, but they are not the intended targets of the message either. The Priyanka card is for the Congress workers who feel dispirited that the party has lost the plot, that it is not serious about taking on the BJP, or even Akhilesh and Mayawati for that matter, to reclaim its lost space. Elections are indeed fought and won or lost on ideas and perceptions, but it is the humble worker who ensures that the party's strength remains on the ground and is not overrun by rivals. Modi's nomination for and campaign in the 2014 Lok Sabha elections owes as much to the reinvigorated BJP workers as it did to his campaign blitz. The latter would have made no difference if it had not energised the workers on the ground to work extra for his victory. Priyanka's nomination by the Congress party, similarly, is a message primarily to the Congress workers that not only is the Family standing up to the BJP and other Opposition parties who have tried to hedge it into tiny boxes, but it will pull out its big guns to fight for its survival. The second message is to the other Opposition parties, that while the Congress party is willing to forge and be part of a broad front to take on Modi and the BJP, that doesn't mean it is going to roll over and die, or make room for the others to climb over it and reach the top. The third message from Priyanka's nomination as general secretary (east) is for Modi and the BJP. By putting the prime minister's constituency on her bailiwick, the Congress has served notice that it is not backing away from the battle. But this last message is still subliminal. We will know the strength of the Priyanka manoeuvre only when she is given an election ticket, and from where. There are only two options, really: Rae Bareli, or Varanasi.